On Thursday, April 5 at 8 PM, New Utrecht Reformed Church and the Mirral Church will hold a Maundy Thursday Communion service in the Parish House. On Friday, April 6 at 8 PM, New Utrecht Reformed Church and the Mirral Church will hold a Good Friday Tenebrae Service of shadows, recounting the seven last words of Christ, in the Parish House. On Easter Sunday, April 8, New Utrecht Reformed Church will hold a Easter Communion Service with a coffee hour afterward. On Sunday, March 18 at the 11 AM service, three Women of Valor will be honored. The honorees are Edna Schembri, member of New Utrecht Reformed Church, Rev. Clara Woodson, New York Regional Synod area minister for the classes of Brooklyn, New York and Rockland-Westchester Counties, and Merrill Hesch, New York City Region, NYS Office of Parks, Recreation and Historic Preservation, Grants Office. A reminder: Daylight Saving Time begins on Sunday, March 11 at 2 AM. Please move your clocks forward one hour the night before. 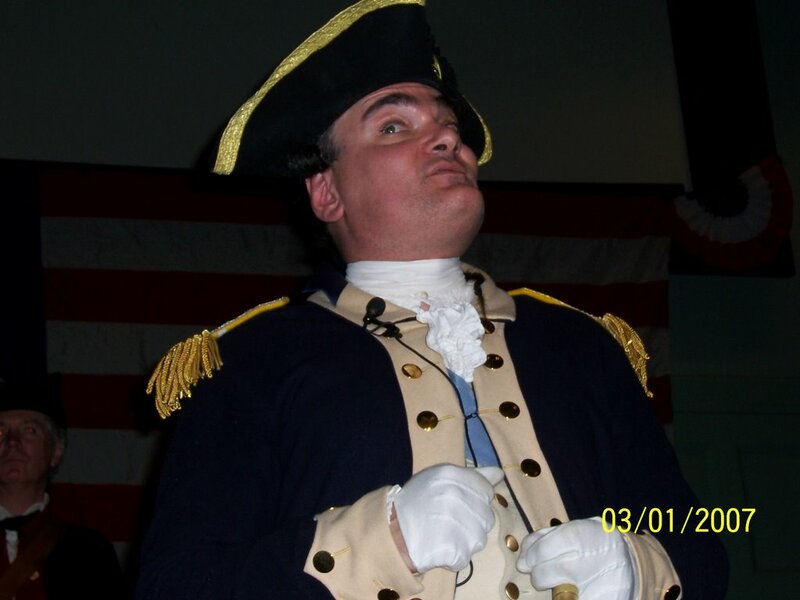 George Washington portrayer Mike Grillo at New Utrecht HS, Thursday, March 1. BROOKLYN - George Washington "wowed 'em" when he came back to Brooklyn, strutting about in the spotlight on the stage at New Utrecht High School, and later addressing area residents in a free community program at the New Utrecht Reformed Church. In both places, he was peppered with questions. "Did you really chop down the cherry tree?" one youngster asked in the morning appearance at the high school. "Are your teeth really made of wood?" called out another of the hundreds of 4th, 5th and 6th graders in the auditorium as two members of the Friends of Historic New Utrecht organization went up and down the aisles with microphones. In both cases, the answer was no. Michael Grillo, Education Coordinator at the Van Cortlandt House Museum in the Bronx, looking very much the part in his costume, complete with hat, explained that wood wouldn't work well for teeth because in the moisture of a mouth it would rot. And he said the cherry tree story had just been made up, too. Why wasn't his hair white, like in the pictures, one of the youngsters wanted to know. Washington explained his hair wasn't always white - not until later. And why did he wear a hat? Simple answer: In those days men wore hats. In the two high school performances, a total of 1,280 students from public and parochial schools attended. One bus after another rolled up between 9:30 a.m. and 10 a.m. March 1. They came from Bay Ridge, Dyker Heights, Fort Hamilton, Borough Park, Bensonhurst, Bath Beach, Gravesend and Marine Park. The community program in the Parish House of the church, at 18th Ave. and 84th St., had every seat filled. This was the former president's first trip back to Brooklyn since 1790. At that time he had come to visit an academy, a portion of which still remains under the ground where the historic New Utrecht Reformed Church and its famous 106-foot "Liberty Pole" stand today. In recent years, the academy walls were the subject of a university archeological dig. Many of the questions the school children asked dealt with the earliest days of the nation and New Utrecht. "We wanted them to have a 'hands-on,' living history experience," said Robert Buonvino, president of the Friends historic group. To augment instruction for the American history presidents program, the education committee of the Friends of Historic New Utrecht prepared a packet of material which was mailed in advance to the teachers. 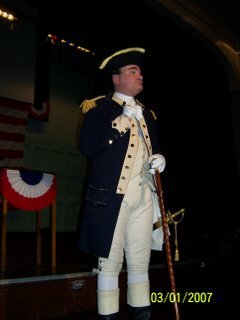 Mr. Grillo has portrayed Washington for the past eight years, starting with school programs at the Purdy House in White Plains. His other appearances include those at the Morris-Jumel Mansion and Fraunces Tavern in Manhattan. 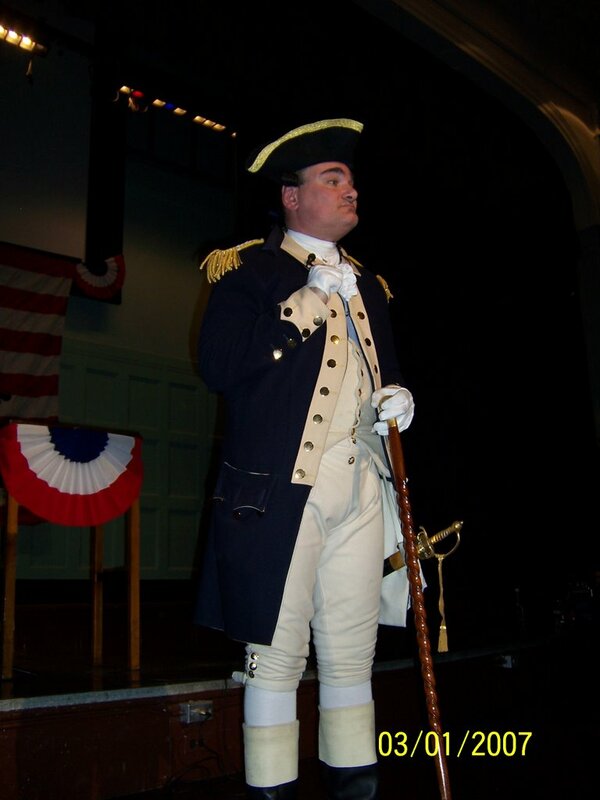 This time he stressed Washington's connections with Brooklyn and New York City as commander of the American Forces at the Battle of Brooklyn, which started on Aug. 22, 1776, with the landing of 15,000 British troops on the New Utrecht shore of Gravesend Bay (14th to 20th Aves. in Bath Beach). He recalled his victorious return to New York in Nov. 1783 and his Farewell Address to his officers at Fraunces Tavern on Dec. 4 and his inauguration on April 30, 1789, in New York as the first president under the Constitution. The flag he would have seen on the Liberty Pole in 1790 was a "Betsy Ross." The Friends arranged to have its 12 by 18 foot Betsy Ross flag, with a circle of 13 stars, hanging as a backdrop behind Washington when he was on the high school stage. According to his diary, when he visited New Utrecht in April 1790 he also had supper at an inn opposite the cemetery the church maintains to this day at 16th Ave. and 84th St. This is the first year Washington has been at the center of the historic organization's presidents program. Past years featured an impersonator of President Abraham Lincoln. In the future, Mr. Buonvono says, it might be possible to have February-March appearances by both Lincoln and Washington. While the historians have several flags, including the "Betsy Ross," they hope their collection can be expanded further to include one representing all the flags the nation has known since 1783. That's when the first Liberty Pole was erected in the town of New Utrecht in celebration of the evacuation of the British. This is the sixth pole to be put in the same spot. Until Dec. 2003, the Friends' cultural-educational programs were held in the New Utrecht Reformed Church sanctuary, built in 1828. The building is undergoing a $2 million restoration and repair. The New Utrecht church itself was founded in 1677 and is part of the mainline Reformed Church in America (RCA) denomination. "Friends is looking to expand our ability to be a useful, helpful tool for educators telling about America's, and Brooklyn's, early history in their classrooms," Mr. Buonvino said. While educational tours continue on the church grounds and at the cemetery, he said, "when the sanctuary is restored we can again give children a better idea of the type of churches that some attended in the country's earliest days." The American history presidents program is supported, in part, by public funds from the NYC Department of Cultural Affairs, NYC Department of Youth and Community Development and the NYS Office of Parks, Recreation, and Historic Preservation. Assistance for the New Utrecht community historical programs has been provided by state Sen. Martin Golden and City Council member Vincent Gentile.